Assortment of 10-11 lens (may include Biconvex, Biconcave, plano convex & concave, meniscus and cylindrical lenses).Assortment of 5-6 prisms (may include right angle, porro abbe, roof, dove, penta, or others). 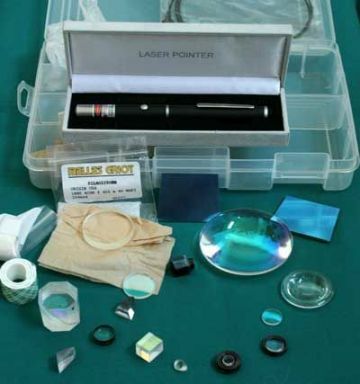 Included with the prism assortment will be one or more beam splitting prisms or lenses. Filters: Polarizing filter, glass neutral density and glass IR/heat blocking filter, set of 6 colored filters (CMY & RGB). 2- front surface mirrors Diffraction grating film: Four 2"x2" diffraction gratings (2 each of 13,500 and 25,400 lines per inch)Double sided mounting tape and putty to secure your optics to most any surfaces. There maybe 1 acrylic lens (in bonus items), all others are made of optical quality glass and many are precision lenses with broadband coatings. No chipped or scratched surplus junk here. (bonus items may or may not have one very small defect not affecting performance). All items are individually wrapped and inspected to prevent any scratches or damage during shipment. The items included in this large premium assortment, if bought directly from their original manufacturers would cost more than $150. Each kit will be slightly different depending on current optics stock and will change over time. I placed my order for this optics kit expecting to get it with a 5mW green laser pointer, but thanks to the slight delay while the 40-piece kit was put together, the ever excellent Optotronics customer service upgraded me to an 18mW pointer to go along with this neat assortment of optic components.